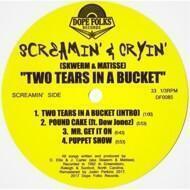 Dope Folks’ 85th release is the never before released “Two Tears In A Bucket” EP from Screamin' & Cryin'. Screamin’ & Cryin’ consisted of Matisse (Jon Carter -DJ, Turntablist and Producer) and Skwerm (David Ellis- MC/Rapper and Lyricist.) “Two Tears In A Bucket” was produced in 1992 in Greensboro and Raleigh, NC, and culminated in Sanford, NC at Beechtree Recording Studios. Previously, they released their only record in 1988 on Popular Records under the name Faze Two. Their “Two Tears In A Bucket” record was never shopped to record labels and it never got the attention it deserved. The group dismantled shortly after finishing production. Dope Folks is excited to unearth these 6 unreleased studio tracks and 1 track that was done for Raleigh Radio!